"130 Liberty Street" redirects here. For the former building also known by this address, see Deutsche Bank Building. 5 World Trade Center (also referred to as 130 Liberty Street) is a planned skyscraper at the World Trade Center in Lower Manhattan, New York City. The site is across Liberty Street, to the south of the main 16-acre (6.5 ha) World Trade Center site. As of June 2018[update], the project is on standby while the Port Authority explores a potential sale of the lot to a developer and looks for tenants to occupy the skyscraper. The proposed building shares its name with the original 5 World Trade Center, which was heavily damaged as a result of the collapse of the North Tower during the September 11 attacks and was later demolished. The Port Authority has no plans to construct a building at 130 Liberty Street, although it is open to future development of the site as office, retail, hotel, residential or some mix of those uses. 5 World Trade Center (5 WTC) was originally a steel-framed nine-story low-rise office building built in 1970–72 at New York City's World Trade Center. The building was designed by Minoru Yamasaki and Emery Roth & Sons. The structure was 118 ft (36 m) tall and had a black exterior. It suffered severe damage and partial collapse on its upper floors as a result of the September 11 attacks in 2001. The remaining structure was demolished by the Port Authority in December 2001, making way for reconstruction. The building was L-shaped and occupied the northeast corner of the World Trade Center site. Overall dimensions were 330 by 420 feet (100 by 130 m), with an average area of 120,000 square feet (11,000 m2) per floor. The Chambers Street and World Trade Center (A, ​C, and ​E trains) subway stations were located directly east of the building, and access to the station was available through the lobby. The building's remaining underground concourse space housed The Mall at the World Trade Center. The largest Borders bookstore in New York City spread across three floors of 5 World Trade Center, on the corner of the building adjacent to the intersection of Church and Vesey Street. In 1984, artist Joanna Gilman Hyde painted the 10,000-square-foot (930 m2) canvas titled "Self Organizing Galaxy" on the roof of 5 World Trade Center. Drawing of the original World Trade Center complex. 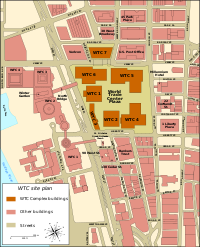 The "¬"-shaped building on the northeast corner of the site is 5 WTC. A picture showing the remnants of the World Trade Center complex. The original outline of the entire site can be seen at left. 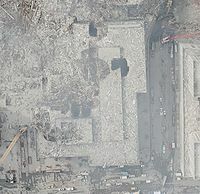 5 World Trade Center in a NOAA aerial image following September 11, 2001. Floors 4–9 suffered partial collapse and/or fire damage as a result of the September 11 attacks. Floors 1–3 were not damaged. The building's structural integrity on its upper floors were partially compromised due to the impact of steel and other debris from the North Tower. Other collapsed sections were due to fire damage. Portions of internal collapse and burnout were found on upper floors, mainly floors 6–8. The black exterior facade suffered severe fire damage. Floors 5–9 were on fire after the collapse of the South Tower. A section of the fuselage from United Airlines Flight 175 landed on the roof. 5 WTC was the least damaged building of the entire complex. The Borders bookstore was undamaged after both towers collapsed. The building was the location of the Survivors' Staircase, which was recovered from the building's underground after it was demolished. The building was demolished by weakening its internal structure and using cables to pull down the rest of the structure, the same way 4 World Trade Center and 6 World Trade Center were demolished. The last standing section of 5 WTC was removed by December 2001. The Federal Emergency Management Agency (FEMA)/ASCE Building Performance Study Team found that some connections between the structural steel beams failed in the fire. 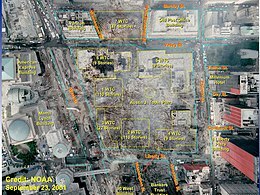 This was most apparent in the collapse of 5 World Trade Center, where the fireproofing did not protect the connections, causing the structure to fail. The structural failure didn't cause the entire building to collapse, as seen after the attacks that the structural skeleton remained intact. 2 World Trade Center will stand at the exact location where the original 5 World Trade Center once stood. 5 World Trade Center (5 WTC) was expected to be designed for residential or mixed use in the original master plan for the complex by Daniel Libeskind. The building was to have a height limit of no more than 900 feet (270 m) and up to 1,500,000 square feet (140,000 m2) of floor space. 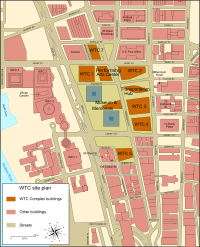 Negotiations over the World Trade Center site concluded in April 2006, with private developer Larry Silverstein yielding his right to develop on the site designated for One World Trade Center along with 5 World Trade Center to the Port Authority of New York and New Jersey in exchange for assistance in financing Towers 2, 3, and 4. The Deutsche Bank Building began undergoing deconstruction in March 2007, which was finally completed by 2011. During this time, work along Liberty Street involved preparing the northern quadrant of the site for development. After site preparation work was done, construction began on the Vehicular Security Center and Liberty Park, which are both complete as of 2016. On June 22, 2007, the Port Authority announced that JPMorgan Chase will spend $290 million to lease the site until 2011 for construction of a 42-story building. JPMorgan Chase would eventually back out of the deal, leaving the Port Authority with no plans to build the skyscraper. Following JPMorgan Chase's acquisition of Bear Stearns in March 2008, the company announced plans to use Bear Stearns' existing headquarters at 383 Madison Avenue as its new headquarters for J.P. Morgan Investment Bank. The company abandoned plans to occupy a skyscraper at 130 Liberty Street. A proposal to convert the planned office tower into a residential or mixed-use tower was explored instead. On May 1, 2008, deconstruction of the former Deutsche Bank building resumed. On May 11, 2009, it was announced that the Port Authority was proposing to cancel the construction of 5 World Trade Center altogether as part of an overall plan to halve the amount of office space available in the fully reconstructed World Trade Center to 465,000 square metres (5,010,000 sq ft). The agency, citing the recession and disagreements with developer Larry Silverstein, also proposed the reduction of 200 Greenwich Street and 175 Greenwich Street to "stump" buildings of approximately four-stories. It was proposed in July 2009 to move the planned construction site for the Performing Arts Center to the 130 Liberty Street location, but these plans were later rejected. The Performing Arts Center was planned to be constructed near the center of the World Trade Center site as part of the National September 11 Memorial & Museum. At that location, construction would not begin until 2015. The proposal did not specify whether the Performing Arts Center would occupy the entire site, thereby ending plans for 5 World Trade Center, or if the center would become integrated into a new mixed-use skyscraper on the site. On March 25, 2010, the Port Authority announced that it had assumed responsibility for the development of 5 World Trade Center, in addition to One World Trade Center, the National September 11 Memorial & Museum, the transportation hub, and other site infrastructure. Towers 2, 3, and 4 would continue to be developed by Silverstein Properties. On June 15, 2010, New York University had expressed interest in expanding to 5 World Trade Center as part of its NYU 2031 program. These plans were also eventually rejected. On February 28, 2011, the deconstruction of the Deutsche Bank Building was completed, and construction of another World Trade Center project, the Vehicular Security Center and Tour Bus Parking Facilities began. Development of the site was officially given to the Port Authority of New York and New Jersey. On September 1, 2011, the Port Authority of New York and New Jersey began construction to incorporate the site into the new WTC development, acting as its developer. On October 14, 2011, Governor Andrew Cuomo announced an agreement to rebuild the St. Nicholas Greek Orthodox Church in Liberty Park. The church would be located adjacent to the future Liberty Park, which would be built on top of the Vehicular Security Center. On December 9, 2011, Phase 2 construction of the South bathtub, located on the site of 130 Liberty Street, continued with the excavation and concrete placement. By 2012, concrete placement and steel erection of the South Bathtub continued. By May 10, 2013, the ground was prepared for construction. A walkway that is next to the site of 5 WTC, will be constructed into a supermarket. By 2014, the ground had been transformed into parking spaces for vehicles belonging to the Port Authority Police Department (PAPD). According to the agency, this usage of the site is only temporary. The original design for the tower was by Kohn Pedersen Fox, and called for a 42-story building with a seven-floor cantilevered section starting at the 12th floor. This section of the building would have housed JPMorgan Chase's large trading floors, rising above the St. Nicholas Greek Orthodox Church, and would be taller than 7 World Trade Center. As of September 2013, the Lower Manhattan Development Corporation and Port Authority were actively marketing the site, but had not released any information about the building. In June 2018, YIMBY reported on a new design for the tower, after a rendering was spotted on a fence surrounding the construction site, hinting an announcement from the Port Authority may be coming soon. According to the article, it is "a glassy building with a triangular motif reminiscent of the David Childs-designed 1 WTC. The depiction is roughly 70 stories in height, which could indicate yet another supertall is planned for the area." ^ Appelbaum, Alec (2007-06-30). "Kohn Responds to WTC5 Criticisms". Architectural Record. Retrieved September 15, 2011. ^ "Five World Trade Center". Emporis. Retrieved 2009-08-07. ^ a b "New Renderings Appear for Supertall 5 World Trade Center". New York YIMBY. June 14, 2018. Retrieved October 30, 2018. ^ Dunlap, David (12 January 2011). "10 Years After 9/11, Deutsche Bank Tower Vanishes". New York Times. Retrieved 21 April 2014. ^ "New York Day By Day: Putting Mop to Canvas". The New York Times. September 5, 1984. ^ Testimony of Dr. W. Gene Corley Archived 2009-09-20 at the Wayback Machine, on behalf of the American Society of Civil Engineers (ASCE), to Subcommittee on Research, Committee on Science, U. S. House of Representatives, May 1, 2002. ^ Naanes, Marlene (2007-06-22). "JP Morgan releases WTC tower plans". am New York. Archived from the original on 2007-12-11. Retrieved September 15, 2011. ^ Cuozzo, Steve (2008-03-18). "Deal's Downtown Domino". New York Post. Retrieved 2008-03-21. ^ a b c d e Shapiro, Julie (2009-07-17). "Arts center might swing over to the south side". Downtown Express. Retrieved 2009-07-18. ^ "Work to Resume at Burned Bank Tower". The New York Times. The Associated Press. May 1, 2008. Retrieved 2010-07-31. ^ "Joint Statement on World Trade Center Development". Port Authority of New York and New Jersey. 2010-03-25. Retrieved 2010-03-25. ^ "NYU Considers WTC for Expansion Plan". NBC New York. 2010-06-15. Retrieved February 28, 2019. ^ "World Trade Center South Bathtub / Vehicular Security Center". Archived from the original on 2012-01-09. Retrieved January 8, 2012. ^ Lower Manhattan Construction Command Center. "130 Liberty Street". Archived from the original on March 28, 2011. Retrieved January 8, 2012. ^ "Governor Cuomo Signs Agreement to Kick-Start The Rebuilding of the St. Nicholas Greek Orthodox Church in Lower Manhattan". Governor's Press Office, New York. October 14, 2011. Retrieved January 8, 2012. ^ The Port Authority of New York & New Jersey (June 4, 2009). "Ask The Port Authority". Retrieved January 8, 2012. ^ Lower Manhattan Construction Command Center. "World Trade Center South Bathtub / Vehicular Security Center". Archived from the original on 2012-01-09. Retrieved January 8, 2012. ^ Cuozzo, Steve (2007-06-22). "What a Zero!". New York Post. Archived from the original on December 22, 2008. Retrieved September 15, 2011. ^ Schuerman, Matthew (2007-06-21). "Chase Tower to Shadow Church". The New York Observer. Archived from the original on 2015-06-10. Retrieved September 15, 2011. ^ "New Port Authority chief Pat Foye addresses audit, W.T.C. in exclusive interview". 2012-03-14. Retrieved September 4, 2013.